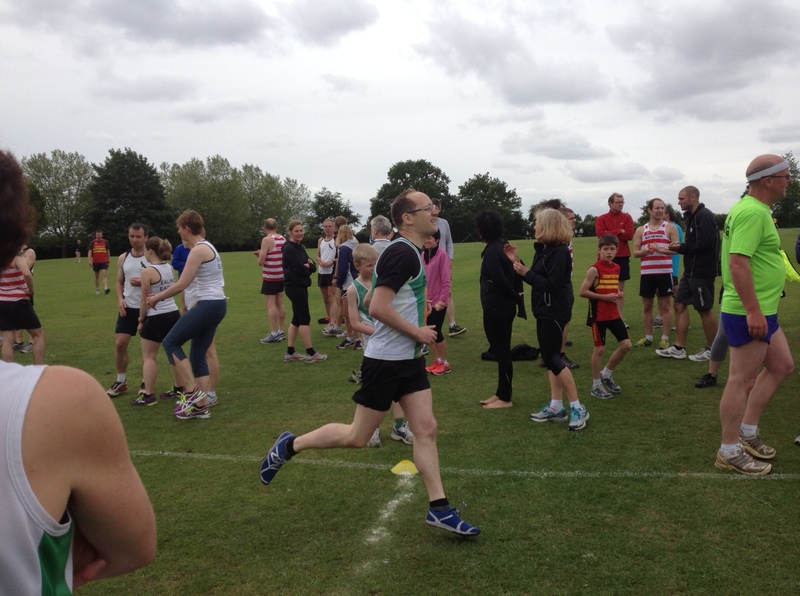 This week’s Guardian running blog reports from the Ealing half marathon. At least two friends were running in the same race; both ran personal bests (1 hr 24 and 1:41 respectively); they didn’t complain about the hills, but did say that it was hot. Indeed, it was hot again on Tuesday evening when I ran my running club’s standard long (7.5 mile) run. A friend J- likes to make us run hard durin the penultimate mile which we usually run at or just below 7 minutes. By the end, you could see our group sweating just as much as you’d expect if we were running in June or July. Carter speculates that the Ealing Eagles, hosts of the Ealing half, have an unduly competitive logo (“Don’t let the club down”). She should try watching them in the Summer League (above), a 6 match championship involving a mixture of 5 and 6 mile races and 400m relays run between the main London running clubs. The Eagles may not have the fastest 10k runners, but they certainly have the most, and the fastest, track athletes – by the fourth sets of summer league relays (no athlete is allowed to run in more than one relay), most of the teams are down to primary-school age children. The Eagles by contrast have a seemingly inexhaustible source of male runners in their 20s, looking to run 60 seconds or thereabouts for the 400 metres. One big differences I’ve noticed this autumn, compared to previous years, is that my local council no longer sends a warden to open and close park gates at sunset but leaves them open overnight. On occasion, I run for an hour around our local park in utter darkness, hoping (especially on the first lap) that no-one has left a glass bottle on the path for me to land on. Meanwhile, the police appear to have cleared the rough sleepers from my other, canal, route. By late August, there were often be as many as eight or ten people – some in tents, some with nothing but their clothes – sleeping rough along a narrow route of about three miles. There has of course been no increase in the amount of social housing, it’s just that political pressure has been exercised on the police to move people on, and move the problem from the centre of London (where the businesses are) to its outskirts. I wore compression socks for a month before developing a numb patch on my shin. Two years later, it’s still numb. Pete, I’m not going to pretend I have any idea what caused the patch – I don’t (you need to ask a doctor not a blogger). But just looking at one possible cause of the symptoms you describe (http://www.running-physio.com/shin-pain-part-two/); the people who have put that site together don’t oppose compression socks with numbness, actually they suggest they may help a little with the symptoms.